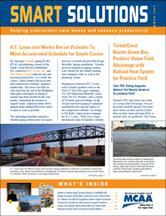 Gootee Construction, Inc. was simply looking for estimating software that worked right. When they started using QuoteExpress Piping’s On-Screen input, they found that they also had discovered time savings (faster takeoffs), training savings (quicker to learn), and space savings (fewer plans to store and manage). A mechanical contractor based in Metairie, LA, Gootee Construction was experiencing problems with their estimating software package. Harry Parker, lead estimator, said, “The problems were unreal, and it might be a week later that [the software provider] called back—if they ever did.” So owner Ken Gootee began looking at other estimating options. He settled on QuoteExpress because it’s a simple system to use (Parker said even though he was new at estimating, he was ready to use the software with one two-hour training session) and because Gootee typically gets support immediately or within the hour. But the real find was the On-Screen portion of the system. On-Screen is a input method that allows estimators to import a digital plan file (e.g., in PDF, TIFF, JPEG, or other format) into QuoteExpress and display it on the computer monitor. It gives estimators the ability to input directly from the engineering drawings without a printed blueprint or a digitizer . Takeoff requires only a computer mouse (instead of a digitizer pen). With On-Screen, you use virtual highlighters to scale lengths of pipe or strip fittings, accessories, and equipment from the screen. You automatically mark up and color-code your takeoff as you go, eliminating the need to highlight every line on a printed plan. You can set the On-Screen system to only take off the fittings and automatically add the pipes between them. The change will be communicated automatically into your audit trail. 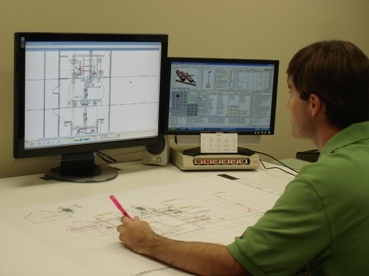 According to Parker at Gootee Construction, the new QuoteExpress Piping system lets him do almost “twice the takeoffs. Jobs that took a week or more I can do in three or four days.” Parker uses On-Screen to sketch out some of the system details—and he gets totals as he draws. In fact, some design/ build contractors use QuoteExpress On-Screen to sketch out systems so that they can put together rough early budgets.“ I draw in my own refrigerant lines—the (engineers) never put them in. And I can run domestic water to all the fittings instead of guessing,” said Parker. He also draws up the vent piping above ground. “I do my own riser diagrams on the drawing so I don’t have to go back and forth,” he added. On-Screen has a fairly short learning curve and can be used across the company. Project managers (PM) can put together a quick change order using the system. Because all the pricing is set up in advance by the main user, a PM only needs to select the correct items and draw the change. Parker likes that he can use different colors or layers to take off different systems—especially because he rarely gets plans broken down that way any more. He can use the same drawing and do the takeoff separately, viewing only those systems he wants to see. The zones for reporting can be divided up the same way. Parker said his other favorite feature is something you simply cannot do on a paper drawing—zoom in. “1/32 scale on restrooms, those can be really hard to read,” he noted. With On-Screen, you can pan and zoom in on any area as tightly as necessary. “Now I can see if the letters say ‘p1’ or ‘p4’ or whatever it says,” Parker pointed out. Savings 1: Printing, retrieving, storing, and managing paper blueprints – Electronic blueprints are easy to manage. Savings 2: Highlighting the drawing – When using On-Screen, your drawing is automatically highlighted as you do takeoff. by cutting and pasting, dragging or dropping, or re-entering. Even infrequent users can easily make changes.